What is Azure Virtual WAN? Azure Virtual WAN is a networking service that provides optimized and automated branch connectivity to, and through, Azure. Azure regions serve as hubs that you can choose to connect your branches to. Once the branches are connected, you can leverage the Azure backbone to establish branch-to-VNet and branch-to-branch connectivity. For a list of partners and locations that support Virtual WAN VPN, see the Virtual WAN partners and locations article. Azure Virtual WAN brings together many Azure cloud connectivity services such as site-to-site VPN (generally available), ExpressRoute (Preview), point-to-site user VPN (Preview) into a single operational interface. Connectivity to Azure VNets is established by using virtual network connections. Integrated connectivity solutions in hub and spoke: Automate site-to-site configuration and connectivity between on-premises sites and an Azure hub. Automated spoke setup and configuration: Connect your virtual networks and workloads to the Azure hub seamlessly. Intuitive troubleshooting: You can see the end-to-end flow within Azure, and then use this information to take required actions. virtualWAN: The virtualWAN resource represents a virtual overlay of your Azure network and is a collection of multiple resources. It contains links to all your virtual hubs that you would like to have within the virtual WAN. Virtual WAN resources are isolated from each other and cannot contain a common hub. Virtual Hubs across Virtual WAN do not communicate with each other. The ‘Allow branch to branch traffic’ property enables traffic between VPN sites as well as VPN to ExpressRoute (currently in Preview) enabled Sites. Hub: A virtual hub is a Microsoft-managed virtual network. The hub contains various service endpoints to enable connectivity from your on-premises network (vpnsite). The hub is the core of your network in a region. There can only be one hub per Azure region. When you create a hub using Azure portal, it creates a virtual hub VNet and a virtual hub vpngateway. A hub gateway is not the same as a virtual network gateway that you use for ExpressRoute and VPN Gateway. For example, when using Virtual WAN, you don't create a site-to-site connection from your on-premises site directly to your VNet. Instead, you create a site-to-site connection to the hub. The traffic always goes through the hub gateway. This means that your VNets do not need their own virtual network gateway. Virtual WAN lets your VNets take advantage of scaling easily through the virtual hub and the virtual hub gateway. Hub virtual network connection: The Hub virtual network connection resource is used to connect the hub seamlessly to your virtual network. At this time, you can only connect to virtual networks that are within the same hub region. Hub route table: You can create a virtual hub route and apply the route to the virtual hub route table. You can apply multiple routes to the virtual hub route table. Site: This resource is used for site-to-site connections only. The site resource is vpnsite. It represents your on-premises VPN device and its settings. By working with a Virtual WAN partner, you have a built-in solution to automatically export this information to Azure. Virtual WAN allows three types of connectivity: site-to-site, point-to-site (Preview), and ExpressRoute (Preview). When you create a Virtual WAN site-to-site connection, you can work with an available partner. If you don't want to use a partner, you can configure the connection manually. For more information, see Create a site-to-site connection using Virtual WAN. The branch device (VPN/SDWAN) controller is authenticated to export site-centric information into Azure by using an Azure Service Principal. The branch device (VPN/SDWAN) controller obtains the Azure connectivity configuration and updates the local device. This automates the configuration download, editing, and updating of the on-premises VPN device. Once the device has the right Azure configuration, a site-to-site connection (two active tunnels) is established to the Azure WAN. Azure supports both IKEv1 and IKEv2. BGP is optional. For a list of the available partners and locations, see the Virtual WAN partners and locations article. A point-to-site (P2S) connection lets you create a secure connection to your virtual hub from an individual client computer. A P2S connection is established by starting it from the client computer. This solution is useful for telecommuters who want to connect from a remote location, such as from home or a conference. P2S VPN is also a useful solution to use instead of S2S VPN when you have only a few clients that need to connect. To create the connection, see Create a point-to-site connection using Virtual WAN. ExpressRoute lets you connect on-premises network to Azure over a private connection. To create the connection, see Create an ExpressRoute connection using Virtual WAN. For location information, see the Virtual WAN partners and locations article. What is the difference between an Azure virtual network gateway (VPN Gateway) and an Azure Virtual WAN vpngateway? Virtual WAN provides large-scale site-to-site connectivity and is built for throughput, scalability, and ease of use. ExpressRoute and point-to-site connectivity functionality is currently under Preview. CPE branch devices autoprovision and connect into Azure Virtual WAN. These devices are available from a growing ecosystem of SD-WAN and VPN partners. See the Preferred Partner List. Which device providers (Virtual WAN partners) are supported at launch time? At this time, many partners support the fully automated Virtual WAN experience. For more information, see Virtual WAN partners. What are the Virtual WAN partner automation steps? For partner automation steps, see Virtual WAN partner automation. Am I required to use a preferred partner device? No. You can use any VPN-capable device that adheres to the Azure requirements for IKEv2/IKEv1 IPsec support. How do Virtual WAN partners automate connectivity with Azure Virtual WAN? Software-defined connectivity solutions typically manage their branch devices using a controller, or a device provisioning center. The controller can use Azure APIs to automate connectivity to the Azure Virtual WAN. For more information, see Virtual WAN partner automation. Does Virtual WAN change any existing connectivity features? There are no changes to existing Azure connectivity features. Are there new Resource Manager resources available for Virtual WAN? Yes, Virtual WAN introduces new Resource Manager resources. For more information, please see the Overview. How many VPN devices can connect to a single Hub? Up to 1000 connections are supported per virtual hub. Each connection consists of two tunnels that are in an active-active configuration. The tunnels terminate in an Azure Virtual Hub vpngateway. Can the on-premises VPN device connect to multiple Hubs? Yes. Traffic flow when commencing would be from the on-premises device to the closest Microsoft edge and then to the Virtual Hub. Is Global VNet peering supported with Azure Virtual WAN? Can spoke VNets connected to a virtual hub communicate with each other? Yes. Spoke VNets can communicate directly via Virtual Network Peering. However, we do not support VNets communicating transitively through the hub. For more information, see Virtual Network Peering. Can I deploy and use my favorite network virtual appliance (in an NVA VNet) with Azure Virtual WAN? Yes, you can connect your favorite network virtual appliance (NVA) VNet to the Azure Virtual WAN. First, connect the network virtual appliance VNet to the hub with a Hub Virtual Network connection. Then, create a Virtual Hub route with a next hop pointing to the Virtual Appliance. You can apply multiple routes to the Virtual Hub Route Table. Any spokes connected to the NVA VNet must additionally be connected to the virtual hub to ensure that the spoke VNet routes are propagated to on-premises systems. Can an NVA VNet have a virtual network gateway? No. The NVA VNet cannot have a virtual network gateway if it is connected to the virtual hub. Is there support for BGP? Yes, BGP is supported. When you create a VPN site, you can provide the BGP parameters in it. This will imply that any connections created in Azure for that site will be enabled for BGP. Additionally, if you had a VNet with an NVA, and if this NVA VNet was attached to a Virtual WAN hub, in order to ensure that routes from an NVA VNet are advertised appropriately, spokes that are attached to NVA VNet must disable BGP. Additionally, connect these spoke VNets to the virtual hub VNet to ensure spoke VNet routes are propagated to on-premises systems. Can I direct traffic using UDR in the virtual hub? Yes, you can direct traffic to a VNet using Virtual Hub Route Table. Is there any licensing or pricing information for Virtual WAN? Yes. See the Pricing page. How do I calculate price of a hub? You would pay for the service in the hub. For example, 10 branches or on-premises devices requiring to connect to Azure Virtual WAN would imply connecting to VPN end points in the hub. Lets say this is VPN of 1 scale unit = 500 Mbps, this is charged at $0.361/hr. Each connection is charged at $0.08/hr. For 10 connections, the total charge of service/hr would be $0.361 + $.8/hr. Data charges for traffic leaving Azure apply. How do new partners that are not listed in your launch partner list get onboarded? Send an email to azurevirtualwan@microsoft.com. An ideal partner is one that has a device that can be provisioned for IKEv1 or IKEv2 IPsec connectivity. What if a device i am using is not in the Virtual WAN partner list? Can I still use it to connect to Azure Virtual WAN VPN? Yes as long as the device supports IPsec IKEv1 or IKEv2. Virtual WAN partners automate connectivity from the device to Azure VPN end points. This implies automating steps such as 'branch information upload', 'IPsec and configuration' and 'connectivity'.Since your device is not from a Virtual WAN partner ecosystem, you will need to do the heavy lifting of manually taking the Azure configuration and updating your device to set up IPsec connectivity. Is it possible to construct Azure Virtual WAN with a Resource Manager template? A simple configuration of one Virtual WAN with one hub and one vpnsite can be created using an Azure quickstart Template. Virtual WAN is primarily a REST or Portal driven service. Is branch-to-branch connectivity allowed in Virtual WAN? Yes, branch-to-branch connectivity is available in Virtual WAN for VPN and VPN to ExpressRoute. While VPN site-to-site is GA, ExpressRoute and point-to-site are currently in Preview. Does Branch to Branch traffic traverse through the Azure Virtual WAN? How is Virtual WAN different from the existing Azure Virtual Network Gateway? Virtual Network Gateway VPN is limited to 30 tunnels. For connections, you should use Virtual WAN for large-scale VPN. You can connect up to 1000 branch connections with 2 Gbps in the hub for all regions except the West Central region. For the West Central region, 20 Gbps is available. We will be rolling out 20 Gbps to additional regions in the future. A connection is an active-active tunnel from the on-premises VPN device to the virtual hub. You can have one hub per region, which means you can connect more than 1000 branches across hubs. How is Virtual WAN supporting SD-WAN devices? 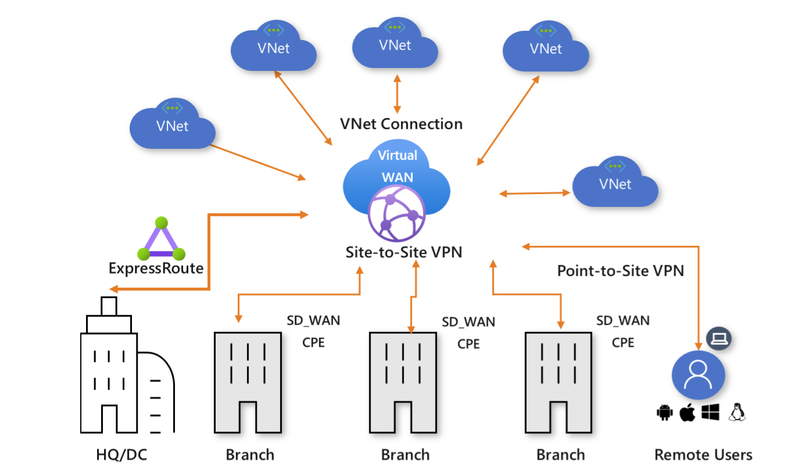 Virtual WAN partners automate IPsec connectivity to Azure VPN end points. If the Virtual WAN partner is an SD-WAN provider, then it is implied that the SD-WAN controller manages automation and IPsec connectivity to Azure VPN end points. If the SD-WAN device requires its own end point instead of Azure VPN for any proprietary SD-WAN functionality, you can deploy the SD-WAN end point in an Azure VNet and coexist with Azure Virtual WAN. Does this Virtual WAN require ExpressRoute from each site? No, the Virtual WAN does not require ExpressRoute from each site. It uses standard IPsec site-to-site connectivity via Internet links from the device to an Azure Virtual WAN hub. Your sites may be connected to a provider network using an ExpressRoute circuit. For Sites that are connected using ExpressRoute in Virtual Hub (Under Preview), sites can have branch to branch traffic flow between VPN and ExpressRoute. Is there a network throughput limit when using Azure Virtual WAN? Number of branches is limited to 1000 connections per hub/region and a total of 2 G in the hub. The exception is West Central US, which has a total of 20 Gbps. We will be rolling 20 Gbps out to other regions in the future. Does Virtual WAN allow the on-premises device to utilize multiple ISPs in parallel or is it always a single VPN tunnel? A connection coming into Virtual WAN VPN is always an active-active tunnel (for resiliency within the same hub/region) using a link available at the branch. This link may be an ISP link at the on-premises branch. Virtual WAN does not provide any special logic to set up multiple ISP in parallel; managing failover across ISP at the branch is completely a branch-centric network operation. You can use your favorite SD-WAN solution to do path selection at the branch. How is traffic routed on the Azure backbone? In this model, what do you need at each site? Just an internet connection? Yes. An Internet connection and physical device that supports IPsec, preferably from our integrated partners. You can optionally, manually manage the configuration and connectivity to Azure from your preferred device.